If you are not sure that our products will work for you, Try a single bottle risk free for 120 days. If you are not pleased for any reason, you may return the bottle for a full refund of the purchase price, minus the cost of shipping. This offer is to allow you to try a product to be certain it will work for you. Please try a single bottle to be sure the product performs to your satisfaction before placing quantity orders. 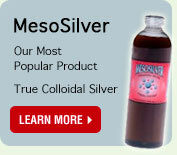 This refund policy only applies to the MesoColloid products that we manufacture.